CooLingerie: Are you get bored with the WHITE wedding dress? Although wedding ceremony exists in the world since ancient times, the history of wearing wedding dresses at wedding ceremony is no more than 200 years. The white floor-length dress with court train was originally a formal Catholic costume. For some European countries at ancient times are theocratic state, the marriage is considered illegal unless the couple go to church for the priest’s blessing. Therefore, at the wedding, the bride wore white formal dress to show God sincerity and purity. In the West before the 19th century, there is no uniform color for bridal gowns. Until 1820, white color gradually becomes widely-used in bridal dress design. This is because the Queen Victoria wore an elegant white wedding dress in the ceremony. Since then, the white dress is taken as the formal wedding wear. Nowadays, with the fashion trends changing, wedding dresses are not limited to white color. Apart from white, ivory, beige and other traditional colors, some light fresh colors are increasingly popular in recent years, such like pearl pink, pink orange, baby blue and pink lilac, very soft and pleasing. For my part, choosing the color of wedding dress simply by personal preferences is not advisable. It is very probably occurred that your favorite color goes against with your skin color. At this situation, I think, it is better for you to listen to suggestions and comments by people around you. Another simple and effective way is to try the most as you can if you have enough energy and your patience. Putting on those wedding dresses you like one by one and then note down your preferences among which you can make the final decision. Anyway, trying on wedding dresses costs no money. 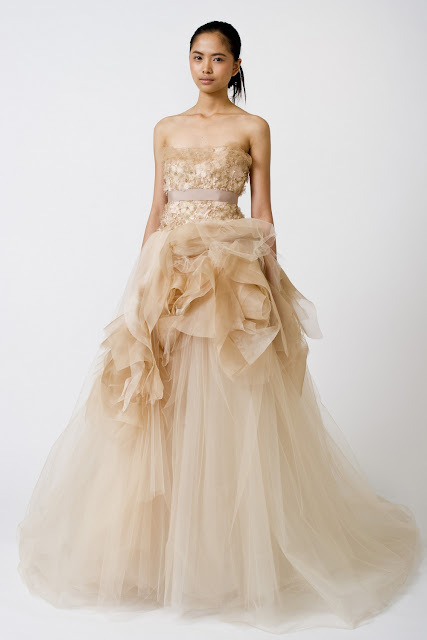 And do not feel troublesome cause it maybe the right way to help you pick your dream gown out. There is a misunderstanding that needs to be clarified. Do not blindly worship those famous brands or the expensive gowns. The best wedding dress is which fits you most. 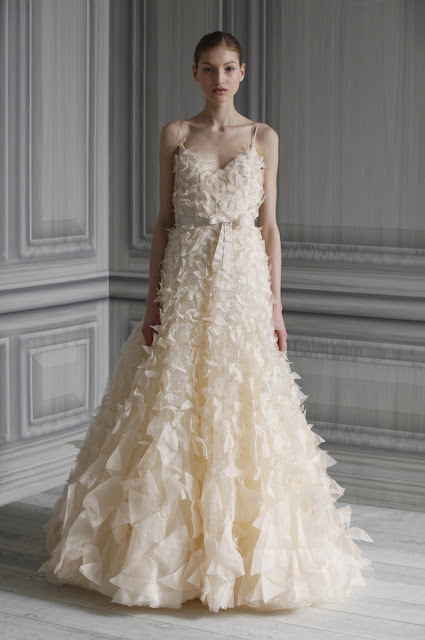 The color of the wedding gown itself plays an important role in match with the bride’s complexion. For the deep yellow skin, the white wedding dress will look dull and dead, while an ivory one would be more harmonious and natural. As for the rosy skin or perhaps bronze skin, wearing a white wedding dress will be very stunning, emitting an extraordinary sparkle together with the groom's tuxedo. For the color wedding dresses, baby blue and pink lilac can be coordinated with white skin while pink orange and powder green with yellowish color. Everyone has several colors he or she dislikes even hates. Then stay away from those colors. An ideal bridal gown must meets three factors: the color, the style and the quality which cannot be separated. Color defines your entire image on your big day and your first impression to the people at the wedding ceremony. So if you choose a wedding dress in a color you hate, just because you’re perfect in that style, then you would not have a good mood all day.